It would seem that the vast majority of my photos from summer can fall under one of four categories - winged things, furry things, flowery things and weather conditions. I also have images from a couple of weddings and a few other things but I guess I'll start with a mix of a few photos from each of the above-mentioned groups. We have frequent visits from this little guy. And by frequent, I mean daily. 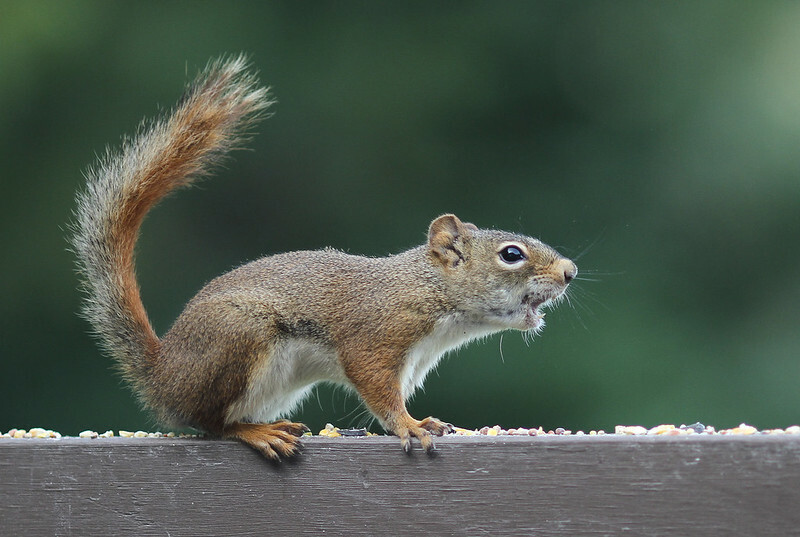 And by daily, I mean that he's back and forth between our supply of seed and peanuts and wherever it is that he stashes the latter - all of a few feet away. In recent weeks, he's been hopping on the patio table and he makes himself quite at home skittering all over Frank's lap, reminding him that he is still around and just about passing out from hunger. He's a bit of a drama queen but adorable as all get-out. That's our Rufus. Every now and then, he has to make sure the neighbourhood knows that he's large (he's really pretty tiny) and in charge (yeah, right). He lets out his warning call (it sounds like this) which Frank says means "Stand aside, everyone. I take large steps!" - a reference from the old movie A Funny Thing Happened on the Way to the Forum. 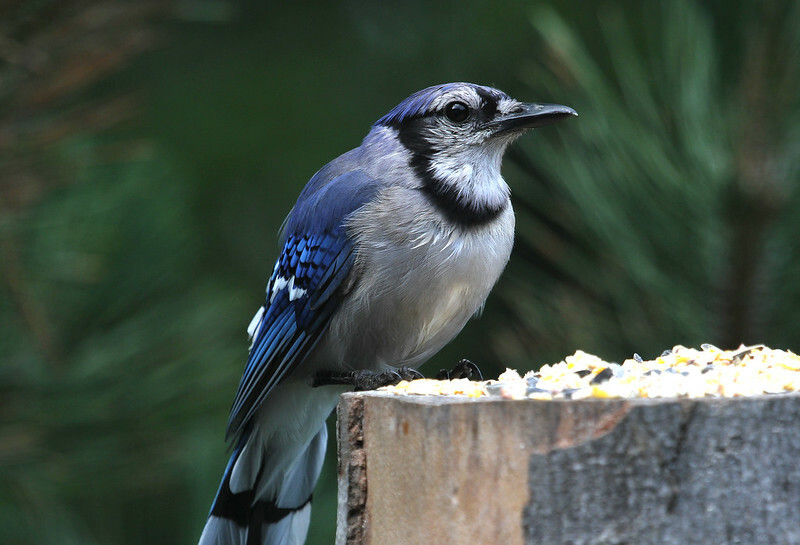 Every now and then, when we toss a peanut for Rufie or one of the chipmunks, a bold-as-brass blue jay will beat them to it. Not much intimidates them. This guy is just learning his way around the goodie hour. He's a cute but goofy looking young one. And an even goofier looking baldie. That seems to happen to a few of them (and other birds) sometime during late summer. It's just part of the moulting process though most birds don't lose all their head feathers at once. We have two of them in this state - this being the worse of them. This is what a summer night looks like outside on our deck. This photo of the patio chair cushion was taken with a flash. Some of these itty bitty bugs get into our house and cling to the ceiling. By morning, they're part of the horizontal surfaces below. They don't last a night indoors. I wonder how many we inhale or otherwise ingest? Here's a little guy we wouldn't mind seeing a little more often. 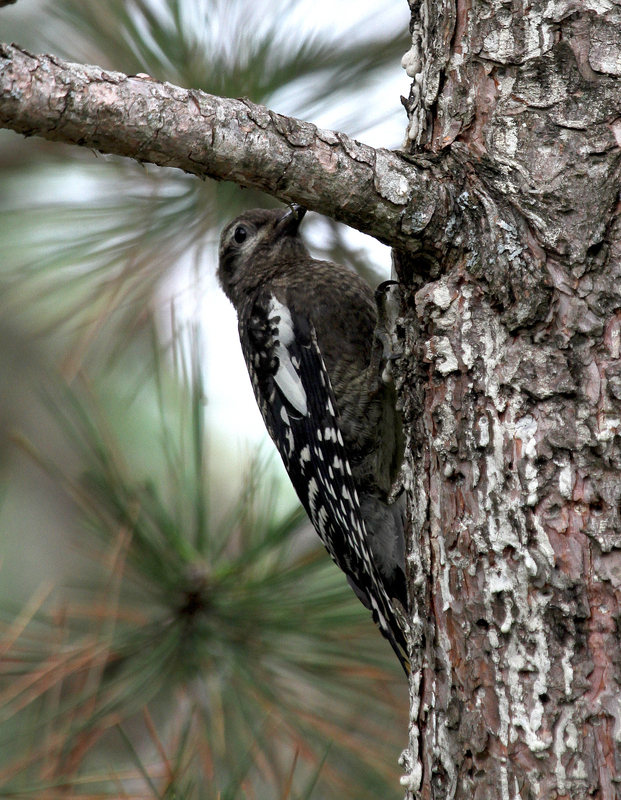 We spotted him in the tree near our deck, one day and though the lighting wasn't great, I snapped a few shots, thinking he was a young Downy or Hairy woodpecker. It turns out that he was neither. We were perplexed, briefly, then Frank said "See what a juvenile Yellow-bellied Sapsucker looks like." And sure enough, that's who he is. Adorable, eh? 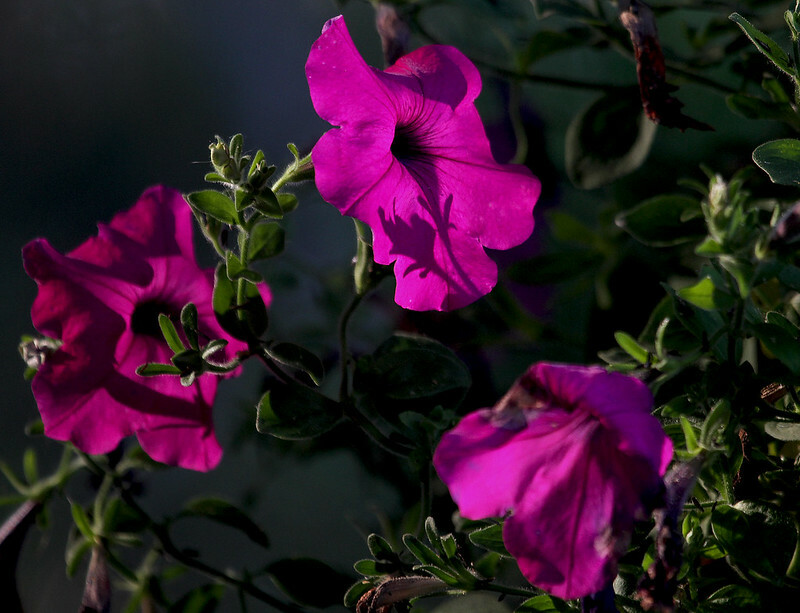 Our hanging pot of petunias look especially vibrant when they're back lit by the late day sun. 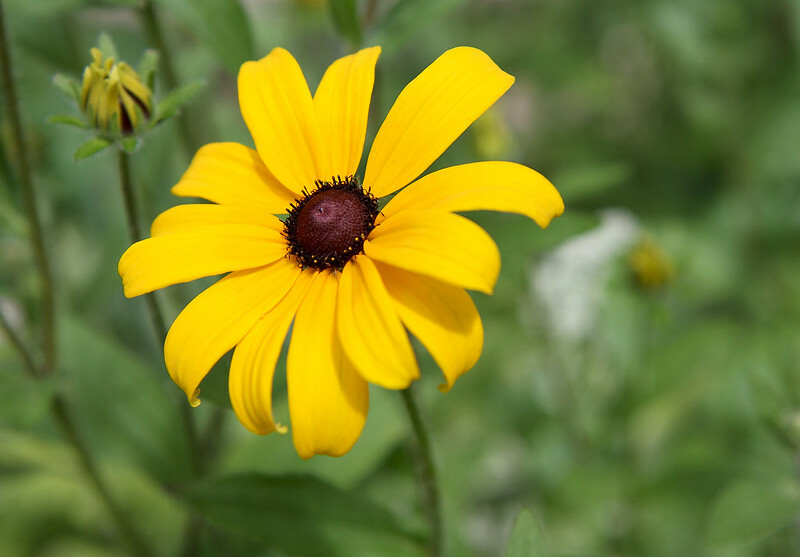 The Black-eyed Susans grow quite profusely around here. They're always a cheery sight on a summer day. And the same goes for daisies. You can't have summer without these sunny charmers. This is what early June looks like across the bay - just a little to the left. Those same spring greens are now showing signs of shifting over to autumn colours. Summer didn't last very long, this year. 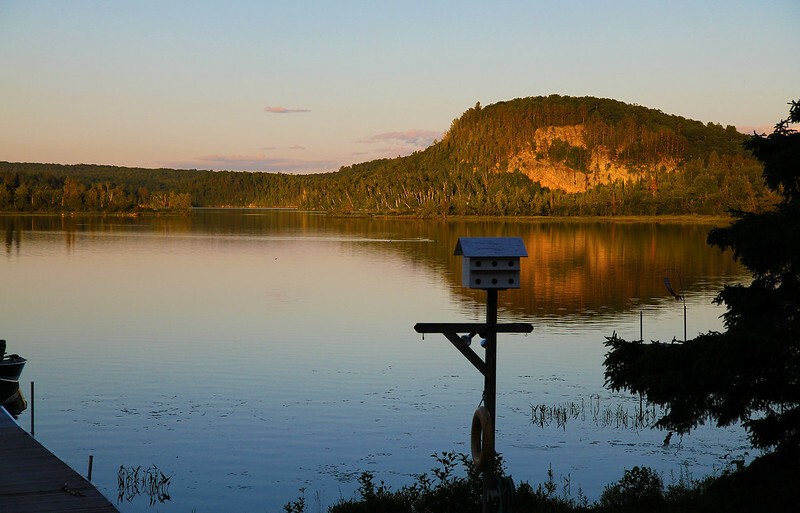 Just three weeks later, across that same bay but over to the right, Blueberry Island glows in the setting sun. Funny how those fresh greens of summer can appear to be ablaze when the sun is low. 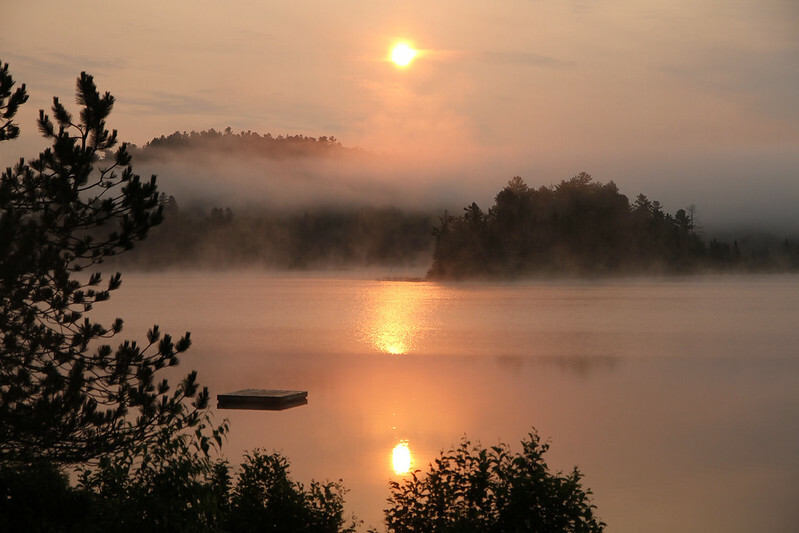 And rather than end with the sun going down, here's a mid-July sunrise, complete with the peachy hues of a misty morn. Right outside our window. Sigh! That's it for this post. I'll have more critters and plant life for you soon. Or maybe something completely different. Ya never know. I don't think I'll ever tire of your new views. Great photographing. Design, composition and ideas. Very sweet atmosphere. So pretty :) Yes, summer is over all too soon this year! Mother Nature dishes out many creatures to us and you are lucky to be right in the middle of it. What a beautiful world you live in! It's such fun to come for a virtual visit! Love all the close up shots - such detail. I have already looked and read several times. Your photos are just breathtaking. What an early morning gift as I sit here in awe. I tried to choose a fave. Couldn't do it. All just FAB!!!!! Such talent! ps…I am so looking forward to your autumn photos. We, who do not really get autumn, cherish your gifts to us. Aren't the blue jays, lovely birds? The grey squirrels make good photos. (They were somehow or other introduced to our country and they chased all our native red ones away and they succumbed to disease that the grey ones were resistant to. We now only have them in the north of England and Scotland). All your photos are lovely but the animals appeal to me most of all. Many have complained around here that we didn't really have a summer because our temps were so mild. I promised myself I wouldn't complain about the weather after all my whining last Winter! It's very cool today and I'm going to make some soup and just enjoy the day and that means enjoying all your photos! I love the last one the best but I laughed at the poor Jay who needs a birdie wig! Rufus is really cute and sounds super tame. I'm surprised your cats don't go crazy when they see him...unless they are indoors all the time? Have a great day and I'll look forward to the fall scenes when those trees are blazing! So if you keep your eyes open , you find a great variety of summer beauty. 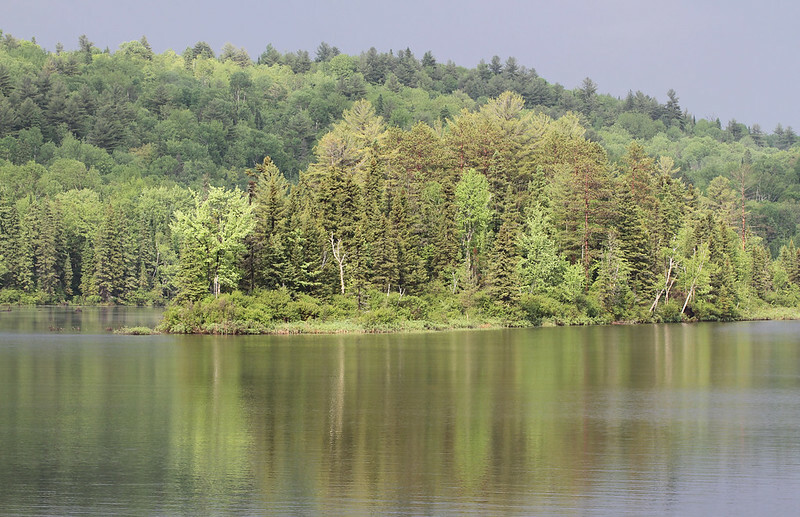 You're fortunate to be surrounded by so much natural beauty and wildlife. I can't imagine your camera is ever far from reach. Beautiful sights! With such vistas, one can rest contented and hopeful any time of the year. Whatever it is, i will enjoy it as i enjoyed this! Summer didn't last long here this year either, Hilary. In addition, it was a very cool summer. There's a lot of magic in those dreamy images. The petunias! A birder told me that those bald blue jays are second year birds. They lose their head feathers during their second year. They look pathetic, don't they? Tiny little blue vultures. That last photo is just gorgeous! Love the light on the squirrel, too. We have molting birds, too! They look so scraggly! Poor things! This was an amazing set of gorgeous pictures. Nice to hear from June that info about the balding jays. You have a lap squirrel, a red lap squirrel? That's crazy and kind of wonderful. Love that last photo. Great photos--I am sure that squirrel will "pose for peanuts"
Whatever category they fall under your photographs are always great. I especially enjoyed these ones because those close-ups at the beginning were out of this world. Many thanks. I'm sending all my squirrels to you! I stomp on the deck when they approach. If I welcome them, they start chewing at the eaves to gain entrance to the house! I love your landscape - bugs and all. Do you use a macro lens for the closeups? I LOVE that first picture of the squirrel. We don't have squirrels that are that color here.... LOVE IT!! Such a cutie! Your photos are brilliant. We have the same critters. 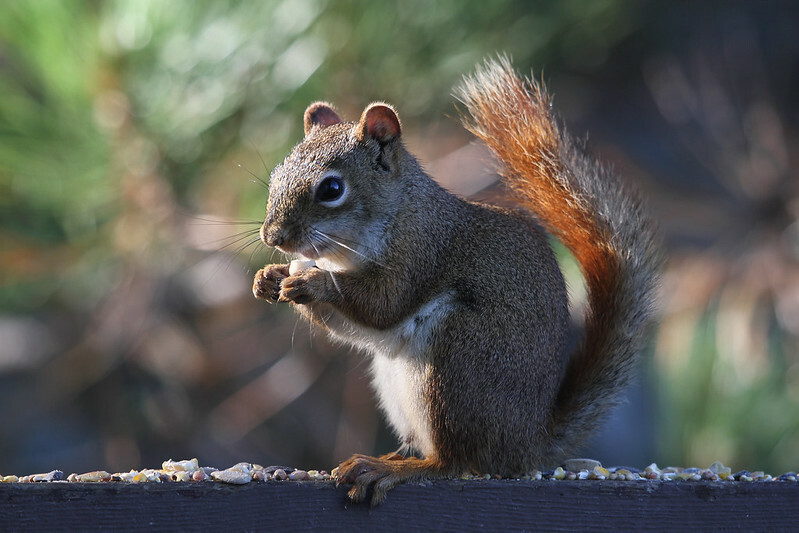 And that red squirrel – who died and made him king?! They are hilarious. (ツ) from Cottage Country Ontario , ON, Canada! I thought you'd discovered a new vulture species! LOVE them critters, especially the furry ones! You are such a wonderful photographer! I always linger at your blog, amazed by what you captured and share with us. Thank you so much. Excellent. 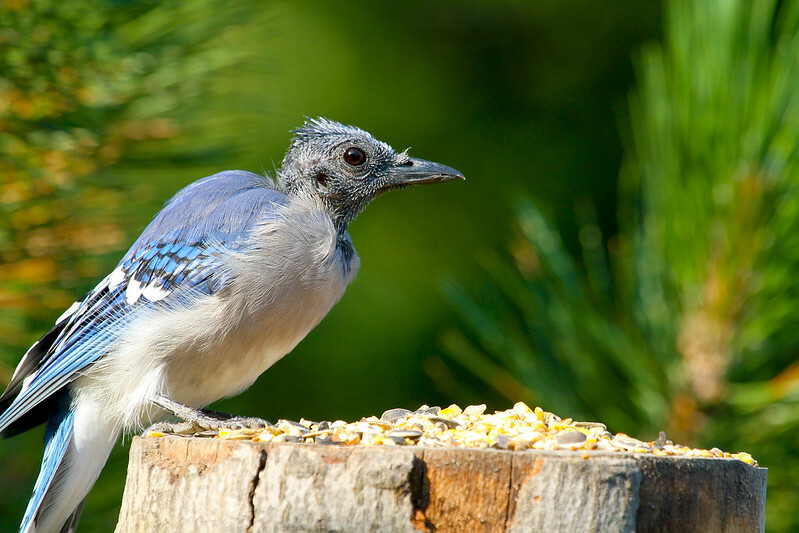 The moulting blue jay is a great pic, but the process creeps me out. I had one at my kitchen feeder a few years back. To me it was "zombie jay." Hi Hilary!! Your nature shots always inspire :) and these are no exception. Such lovely flora and fauna and lake shots around your new home. That sunrise is really gorgeous! I just love your critters and flora and fauna. You capture the personality of each so well. I haven't taken pictures for ever so long. Guess I'm hitting a blip in the road..not a good sign. A beautiful collection of photos! The background of the first blue jay shot is simply awesome. Your view across the bay is breathtaking. Superb shots you've got, the animals, the birds and landscapes are terrific. Sigh- what lovely critter and lake shots. I love your view across the bay in the setting sun. And the blue jay is excellent. Wonderful post..
Ewwww - ingesting teeny little bugs! Now I'll never sleep tonight. LOL. Kidding. But I did see a whole slew of them when I was living in the condo. I'd open my door to the balcony in the evenings to get some fresh air. Only thing is there was no screen and I was facing the lake. 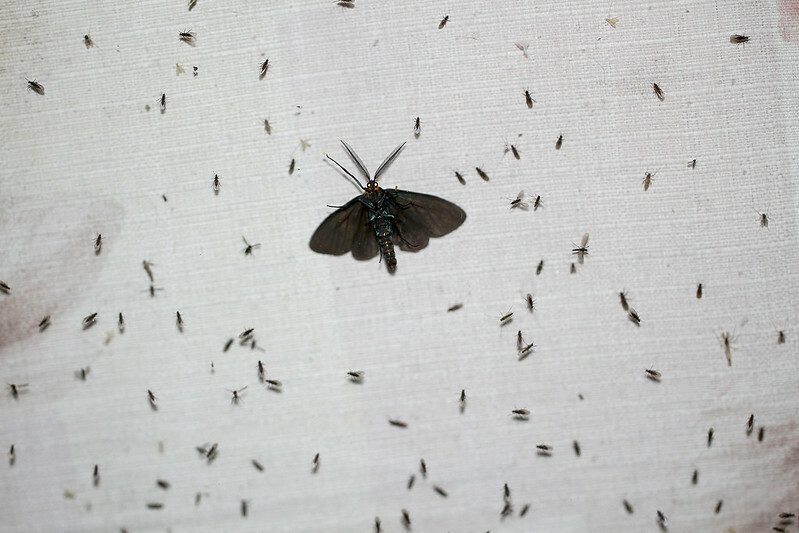 I was chatting on the phone to someone and happened to glance up to the ceiling and saw all these little critters! I'd never seen so many practically covering the ceiling. Yeah, I hung up in a hurry. I tried shooing them away (okay killing them) with a broom, but the ceilings were 9 feet and I couldn't reach that high. When it was time for bed, I shut my door tight (as if that would stop them marching from the living room ceiling and into my bedroom if they wanted to. They didn't. And I was soooo glad they all disappeared by morning. Weird-looking jays. I wondered why they look so strange - never thought of moulting. Hmmm. Love your little Rufus. He's a sweetie. And those flowers shots are so clear. Sunset or sunrise - amazing how spectacular it looks over water. What a gorgeous place you live in. That last photo made me sigh, too! 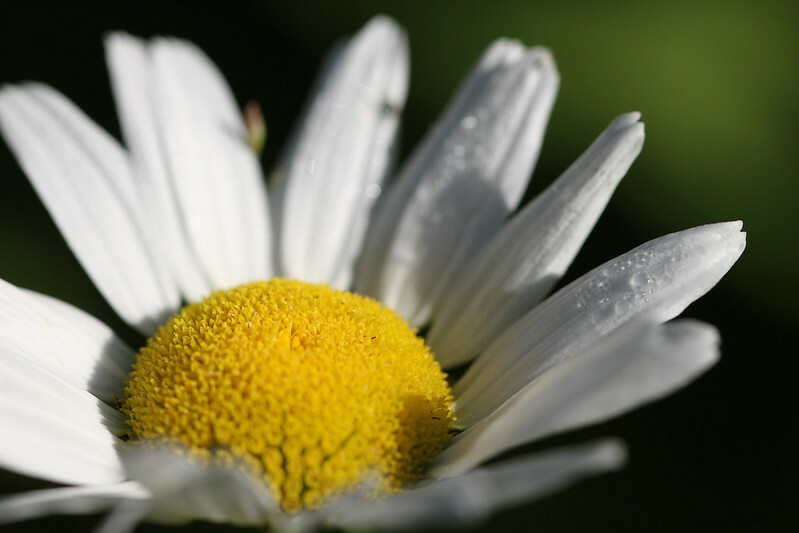 I love your daisy shot. Great perspective. I sympathize with you on those little bugs. They do the same thing here! Mind you, I could do without the bugs, certainly in real life. But I’d love to meditate over the atmospheric view of the mid July sunrise. Makes me want to float. Your poor deck. I am sure there was a lot more. The visitors are too cute. Excellent capture of light in the last few pics. As noted by so so so many... they love your show and tell, and so do I.
Hilary: All stunning, but especially the Blue Jay!